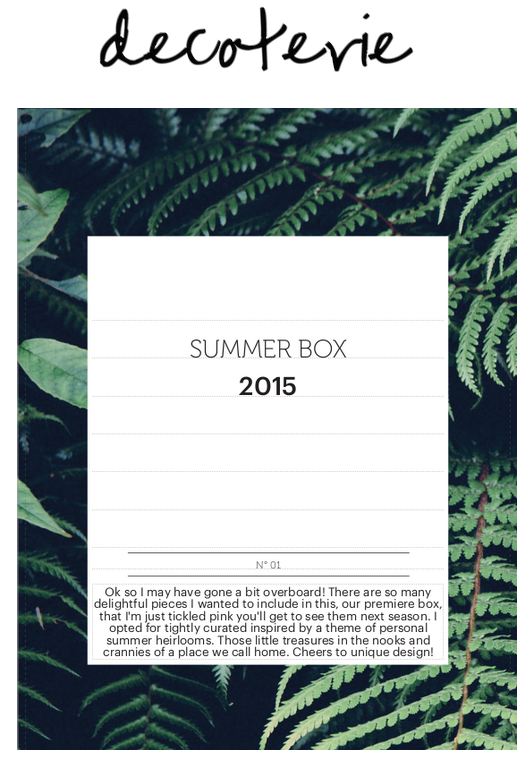 Decoterie Summer 2015 Launch Box Spoilers and Coupon Code! Decoterie has released their full spoilers for their first box! I'm so excited! The boxes should be shipping soon and I cannot wait to get this customized box in my hot little hands! Decoterie is a lifestyle and homewares subscription. Almost everything you find in the box was made here in the USA by people being paid a living wage. The curator, Letitia Elizabeth, really focuses on having the best quality products without using anything from China or encouraging child labor in other countries. 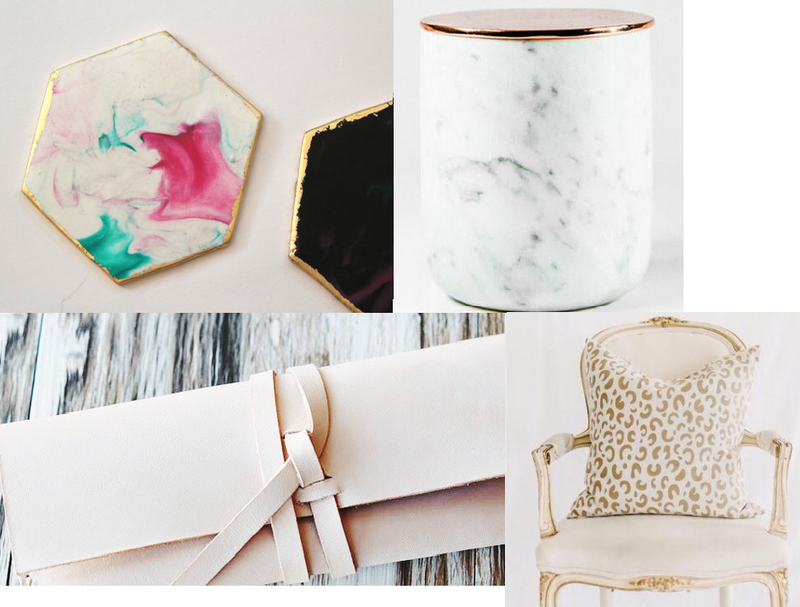 Decoterie strives to be as eco-friendly and as natural as possible while providing beautiful, luxury goods for your home. What You Get: A luxury, hand-packed box containing a selection of 2-5 items ranging from home decor, textile goods, art, decorative accessories, and exclusive collaborations with top designers known as the HERO item. Every box will be curated around a central theme and will have a retail value of at least $300. 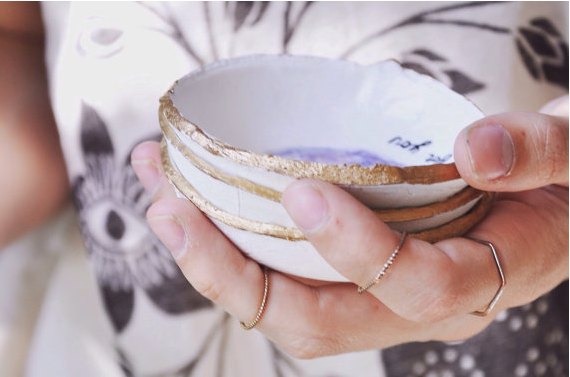 There will be a ceramic bowl customized just for you by Natalie at PlumeEtPapier. A gold leaf, marble coaster set by HawaiiNot. A marble and rose glass, hand-poured candle by Australian artist Sandra of Live Love Soy. I think there are four scent variations. A throw pillow by Letitia Elizabeth (pink and grey leopard print or dark blue, it seems there may be variations) and a blue-green scarf, as well. I think there's also a special extra for everyone who signed up for the first box, too! This summer box is sold out but you can sign up for the Fall box. Use code WELCOMEBB to get 10% off your first box! The note mentions that this first box won't have the official packaging because including the full pillow needed a bigger box. Future boxes will just have a pillow cover (if one is included). What do you think? I'll be honest and say that I love it because this is my style. I know it won't be for everyone but these are so me. I like understated elegance. YESSSSS imagine holding that leather wrap while wearing the Rachel Zoe watch!! OMG, I want that Vachetta leather wrap case to put in my LV totes and handbags. That's the same kind of untanned, undyed leather they use in most of their signature Monogram items. Swoon, I love it so much!! Sadly, I didn't order this sub.-- I'm always leery of home items. My loss. It's always chancy so you were right to wait, especially if nothing else appeals to you. this sounds like such a great box! I wish I could afford it. Maybe sometime next year I'll sign up for it :) looking forward to your post when your box comes in! Maybe they'll do another 40% off coupon :D I'll make sure to post if they do! Glossybox Wants to Give You a Gift! Japan Candy Box June 2015 Review and Giveaway! FabFitFun Summer Box $20 Off Coupon! Boxycharm July 2015 Spoiler #1!